Morning light. If you dream of a simple, yet elegant style, then I highly recommend giving a try to this cream blue shirt tucked in gathered white pants. A perfect combo for Summer months. Let’s talk about shirts. This time I want to bring to your attention stylish shirts that can be dressed up and down in any way you like next year. In term of shirts, it’s not about trends, but finding the one you can match with your clothes and style. Trust me, finding the one and only shirt can make you stand out from the crowd, no matter if you are going to wear it on the streets or on special occasions. It goes with absolutely everything, starting from skirts to trousers and shorts. You can make it look casual, smart, sporty, grungy or festive, all you need is to pair it with appropriate clothing and accessories. Shirts and blouses can make or break your outfit and today I am happy to show you amazing ways how to wear this top in real life during this year. This classic piece of clothing feels good no matter where you go, from office to the streets and fancy parties. In other words saying, it’s an infinite style that works with pretty much everything and anywhere. You are free to wear it with so many garments, including shorts, trousers, jeans, and skirts. Those times when button-down tops used to look boring are gone, today’s fashion designers offer plenty of reinvented styles. I am not saying you should avoid wearing classy and simple blouses, they are still in. Just give a try to funky and crazy print designs. No matter if it’s a faux or real fur vest, there are lots of ways how to make this layering piece look awesome on you. Trust me, if you are going to wear it correctly and follow easy rules, it will become your favorite layering clothing staple for cold season months. It can be worn as a boho essential, or make you look French chic. 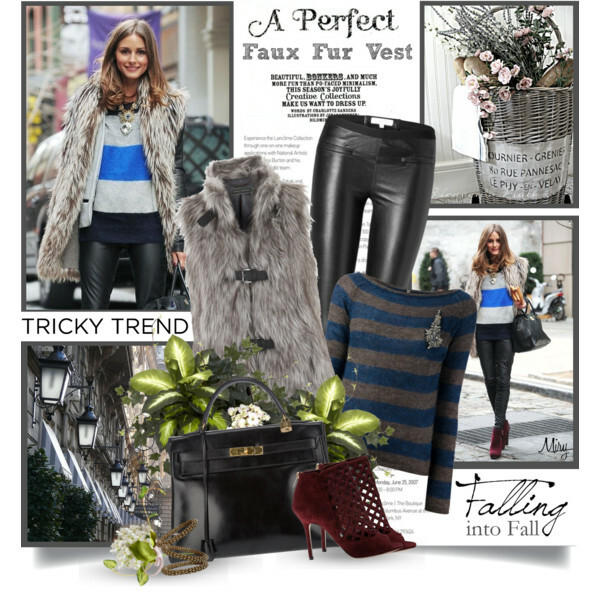 Keep it urban chic by teaming a gray fur vest with a pair of black leather skinnies and gray-blue striped sweater. Add black leather retro shaped handbag and maroon caged peep-toe booties. There some many awesome ways how to make leather skirt be your favorite garment to wear this year. In this article, you can find lots of beautiful outfit ideas you can wear for work and play this year. This beautiful piece of clothing can make you look chic, sweet and edgy. I am pretty sure this skirt is going to be in your wardrobe rotation this year! Keep things neutral! You will need a striped simple t-shirt, geometric print cardigan, black leather mini skirt, and platform black suede booties. Add black leather rucksack and drop earrings in black color. 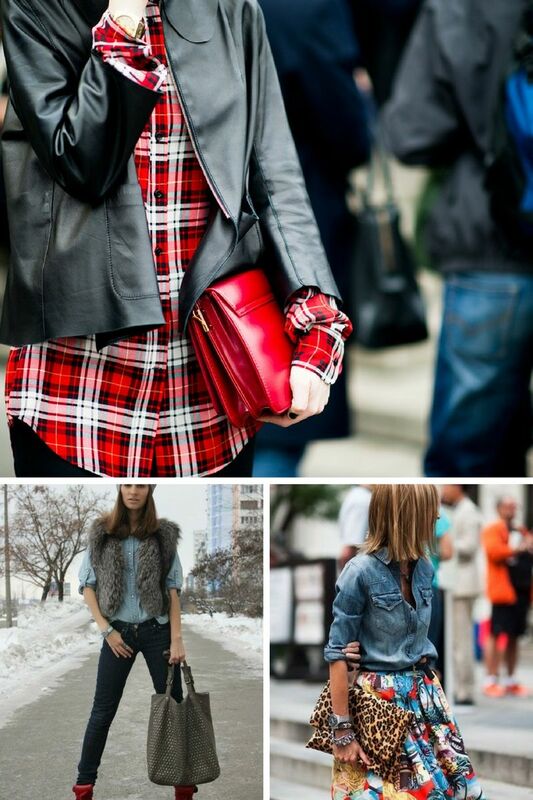 In today’s article, I decided to share my favorite outfits featuring leather jackets and jeans. I personally consider this combination to be one of the best ones so far. It can make any woman look well dressed. I see ladies mostly wearing black leather jackets with white shirts and blue jeans and it’s no wonder why, as it’s a foolproof combo that can instantly make any woman look put together. Keep things sporty and urban. Keep things simple and comfortable, as you will need a pair of light blue ripped boyfriend jeans, black hoodie and a biker jacket in black leather. Complete this look with a pair of black suede platform booties and a black beanie. If there is one fabric that can make you feel and look fabulous, then it’s denim. Today’s article includes awesome denim trends that are fabulous and ideal to wear on the streets. This season designers offer us dresses, jackets, crop tops and cool shorts made of denim. You are about to see interesting patches, ripped and frayed details. I have chosen the most beautiful and interesting outfit ideas you can try this year, so why don’t you create your favorite denim look? That’s what I call a perfect Summer look! We see a short-sleeve blue denim dress with ripped details. Complete it with a skinny beige leather belt, and stiletto sandals. How far can you go with your crop top? Today’s article is dedicated to my favorite 16 crop tops you can try now. The showcased outfit ideas are easy to copy and I am pretty sure, there will be no problem for you to find the one and only look in this collection to give a try this year. Ladies who want to keep things simple I recommend giving a try to this black front knot crop top. It can be teamed with a floral print maxi skirt embellished with fringes. Add black stiletto pumps and a structured black leather bag. This skirt looks very boho inspired. Classic shirts are back in style, so you better know how to wear them the right way! In today’s blog post I want to bring to your attention bright button-down shirts and simple ways how to wear them. If you want to create a stand-out look, but don’t know where to start, then I recommend you giving a try to one of these button-down shirts. The great news is that you can wear them with different bottoms, starting from skirts and trousers to shorts and jeans. The showcased looks are great for office hours, special events, casual walk on the streets and parties. Take a moment to find the best ideas to copy this year. Black and white is always a win-win look! You will need a white blouse with a black necktie, gingham print bow skirt and black tuxedo blazer with white lapels. Complete this simple outfit with a pair of black leather loafers embellished with tassels.